Kaposi sarcoma (KS), the most common AIDS-associated malignancy, is amultifocal tumor characterized by deregulated angiogenesis, proliferation of spindle cells, and extravasation of inflammatory cells and erythrocytes. 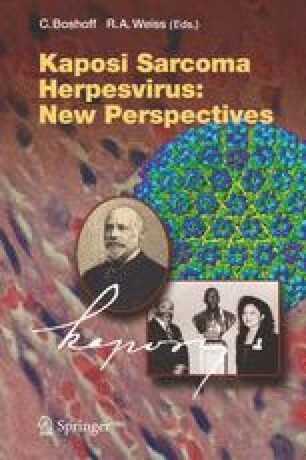 Kaposi sarcoma-associated herpesvirus (KSHV; also human herpesvirus-8) is implicated in all clinical forms of KS. Endothelial cells (EC) harbor the KSHV genome in vivo, are permissive for virus infection in vitro, and are thought to be the precursors of KS spindle cells. Spindle cells are rare in early patch-stage KS lesions but become the predominant cell type in later plaque- and nodular-stage lesions. Alterations in endothelial/spindle cell physiology that promote proliferation and survival are thus thought to be important in disease progression and may represent potential therapeutic targets. KSHV encodes genes that stimulate cellular proliferation and migration, prevent apoptosis, and counter the host immune response. The combined effect of these genes is thought to drive the proliferation and survival of infected spindle cells and influence the lesional microenvironment. Large-scale gene expression analyses have revealed that KSHV infection also induces dramatic reprogramming of the EC transcriptome. These changes in cellular gene expression likely contribute to the development of the KS lesion. In addition to KS, KSHV is also present in B cell neoplasias including primary effusion lymphoma and multicentric Castleman disease. A combination of virus and virus-induced host factors are similarly thought to contribute to establishment and progression of these malignancies. A number of lymphocyte- and EC-based systems have been developed that afford some insight into the means by which KSHV contributes to malignant transformation of host cells. Whereas KSHV is well maintained in PEL cells cultured in vitro, explanted spindle cells rapidly lose the viral episome. Thus, endothelial cell-based systems for studying KSHV gene expression and function, as well as the effect of infection on host cell physiology, have required in vitro infection of primary or life-extended EC. This chapter includes a review of these in vitro cell culture systems, acknowledging their strengths and weaknesses and putting into perspective how each has contributed to our understanding of the complex KS lesional environment. In addition, we present a model of KS lesion progression based on findings culled from these models as well as recent clinical advances in KS chemotherapy. Thus this unifying model describes our current understanding of KS pathogenesis by drawing together multiple theories of KS progression that by themselves cannot account for the complexities of tumor development.